The Best Time to Tweet? Wrong. How about 4pm on a Thursday for the legal industry? There isn’t one. Nobody, and I mean nobody should be telling you the best time to tweet. Your business and your audience are unique. There may be overlaps. There may be trends, but to really find the best time to tweet for your account, you need some tools and some logic and nothing else. The tool which we recommend to use is Followerwonk. It’s a Twitter analytics tool from the guys at Moz, who are themselves wizards at inbound marketing. I just want to focus on one single part of Followerwonk though that you can use though. Firstly head to www.followerwonk.com. Click ‘Try Free with Twitter’ and then the ‘Analyze’ button. Scroll down and you’ll end up with a beautiful graph which shows how active your followers are dividied up by hour. So, 5am-6am might not be the best for us. But we can see that 4pm-5pm is a high point for @optixsolutions. So we should try to tweet more around then. An hours a long time though. Are people more active at 4.05pm, or 4.30pm for example? To dig a little deeper just click to ‘Schedule at Buffer’. The systems will talk to one another, and if you have a Buffer account it will feed in the best times to the exact minute of when would be good to tweet. Nifty eh? Although our ‘peak’ is between 4pm – 5pm that still only accounts for araound 7% of our total followers. Break that down and that means only 186 people might be online. Not bad, but it could be better. What that does mean though is that you could tweet identical tweets at different times of the day; meaning wider coverage for the same amount of effort. If you have an international audience with say, followers in the US, then your graph might be more levelled as the people sleep and work at the same time. The good news is that there might be multiple be multiple good times in a day to end up tweeting. These graphs change – frequently. It’s best to repeat this process once every few weeks to make sure you adapt your times to the changing patterns of your followers. 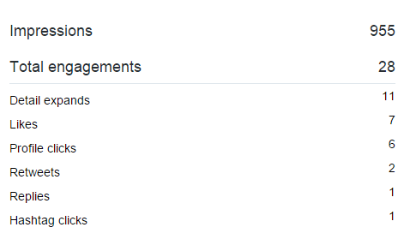 Twitter serves up an awesome array of stats via Twitter analytics. Look at them. Each graph will show you what works and what doesn’t. Followerwonk may should you a good indication of the best times but you’re only going to know for certain through trial and error. Analytics will show you the key details. Work through your tweets over the past 30 days and see what’s worked and what hasn’t. Sometimes, it’s luck. Someone with a large follower count may RT you for instance, but if you map out your engagement next to what times you tweeted it then you should be able to start building a pattern of what time of day and day of the week would work best for you. Repeated the process each month for 3 months and you’ll start to build a genuine picture, of when, hopefully your tweets will have the biggest impact.